Entering into the mindful state of meditation has measurable physiological effects, including increased blood flow to the brain, lower blood pressure, muscle relaxation and a lower respiration rate. Because you relax during meditation, it isn't unusual to experience a period of lightheadedness afterward, but it's rarely a negative symptom. In fact, meditation is used as a therapy for people with some conditions that cause dizziness, such as anxiety disorder and heart disease. 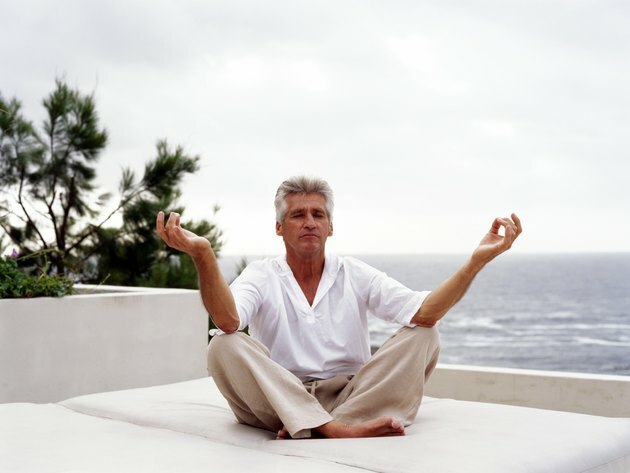 Although there are many techniques for entering into it, the meditative state itself is essentially simple and natural. It is qualitatively different from either the normal waking or the sleep state because, although your body is relaxed and motionless, your mind remains alert and focused. Rather than focusing on anything in particular, however, those experienced in meditating train their minds to rest on emptiness, or the space between thoughts. It requires practice and discipline to enter into deep meditation, but a beginner can experience some of the benefits and effects after even a short session. Meditation reduces stress by helping you disengage from the jumble of thoughts, emotions and sensations that constantly stream through your awareness. The tranquility you experience while meditating has a beneficial effect on many stress-related conditions, such as cancer, heart disease and allergies, makes you feel lighter. Energies blocked by normal daily activities begin to flow, and your body has a chance to re-balance them according to its own innate wisdom. You may interpret this as a feeling of lightheadedness or mild dizziness after your session, especially if you end the session abruptly. The simplest meditation technique, sitting silently and doing nothing, is, for many people, the most difficult one, so many alternative techniques have been devised throughout the ages. Some involve chanting, others involve breathing exercises and still others incorporate the suggestions of a trained facilitator. You may feel lightheaded while doing breathing exercises and chanting, because you alter your oxygen intake, and that affects your brain. If the feeling becomes uncomfortable, MedlinePlus recommends increasing the carbon dioxide in your system by stopping the technique momentarily and breathing out slowly and steadily through pursed lips or covering your mouth and one nostril with your hand and slowly breathing out through the other nostril. Meditation is not the only activity that can produce a feeling of lightheadedness. You may experience a similar feeling after receiving acupuncture therapy or even a deep massage. Acupuncturist Ahuti Ferid welcomes it, saying it is a sign the therapy was successful. It means blocked energies are moving again, and that is a sign of health. Once you realize lightheadedness is normal after deep meditation, you may begin to welcome it. It can be disorienting though, so it's always a good idea to get up carefully after your session, walk slowly and drink plenty of water. Why Does Dizziness Occur After Acupuncture?